Boomerang, a young California sea lion who resides at Mystic Aquarium, was rescued by the California-based non-profit, the Marine Mammal Center. 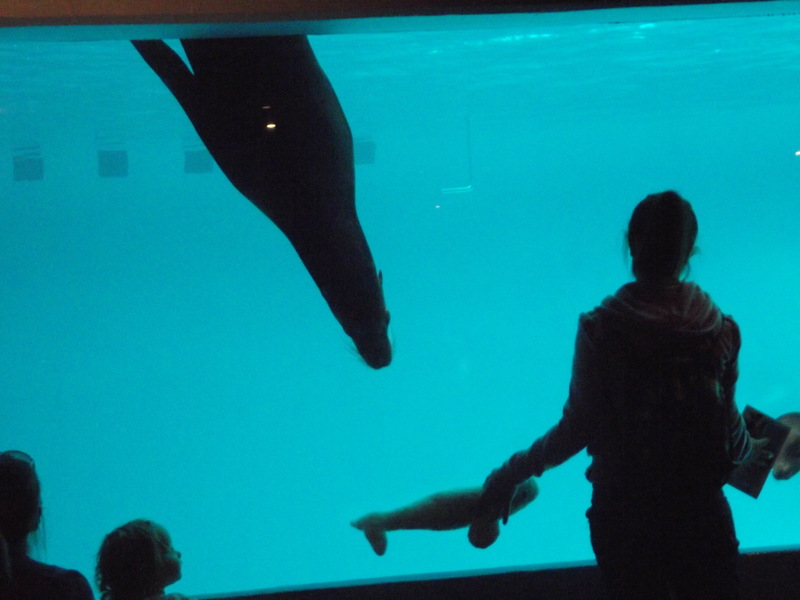 Both Mystic and Marine Mammal Center operate Prescott grant-funded rescue and rehabilitation programs. The following post is a letter I just wrote to my congressman Charlie Bass (R-NH) about my concern over the exclusion of the John H. Prescott Grant Program from next year’s federal budget. This grant was established by NOAA’s National Marine Fisheries Service 12 years ago to provide government funding to marine mammal rehabilitation facilities, such as Clearwater Marine Aquarium, Mystic Aquarium, Marine Mammal Center, SeaWorld, National Aquarium in Baltimore, and Monteray Bay Aquarium in order to continue their work to rescue, rehabilitate, and release marine mammals in trouble. I am writing on behalf of marine mammal rehabilitation facilities nationwide that could suffer from budget cuts if the John H. Prescott Grant Program continues to be excluded from the 2013 federal budget. Last summer, I did an internship at the Clearwater, FL-based Clearwater Marine Aquarium and I saw the work they have put in rescuing and rehabilitating troubled dolphins, otters, and sea turtles in all hopes that they could go back into the wild someday. Clearwater Marine Aquarium, like all other marine life facilities that specialize in marine mammal strandings and rehabilitation, coordinate with NOAA’s National Marine Fisheries Service and respond to over 5,000 animals each year. In response to the public demand for funding, NOAA established the John H. Prescott Grant Program in 2000 to fund the works of all these organizations which has financially sustained them for the last 12 years. Sadly, however, the Prescott funding has not been included in the 2013 funding. Marine mammals, such as orcas, dolphins, and seals play a huge role in the marine eco system and often serve as sentential of ocean health and are often early indicators of unhealthy ocean conditions, such as the effects of oil spills, pollution, habitat loss, and the ever growing concern of climate change which has been recognized with bottlenose dolphin populations in the Gulf Coast that have been effected by the most recent oil spill. Organizations, such as Clearwater Marine Aquarium, and the California-based Marine Mammal Center, are all funded by the Prescott Grant and serve as America’s first responders in these cases and provide the only chance biologists will get to study and understand the how and why marine mammals strand in the first place and provide surveillance for possibly dangerous risks. Without this grant, these organization will have a hard time funding future rescues, rehabilitation and conservation efforts, and just to make matters worse, they may not be able to fund their own future projects in regards to facility upgrades nor operation costs. Because these facilities rehabilitate marine mammals, they meet certain standards of care for their patients which has been established by the US National Marine Fisheries Services and if the Prescott grant continues to remain excluded from next year’s funding, the animals that are being rehabilitated by these facilities will suffer too. Many zoo and aquarium professionals, patrons, and marine biologists are all calling for this life-saving grant to be included in the 2013 federal budget. This is because it allows organizations to continue their work to rescue, rehabilitate and release marine mammals in trouble as well as study the unhealthy effects on the marine ecosystem and what could be done to protect marine mammals and their habitats. I myself am also calling for Congress to restore the Prescott funding because it allows these organizations to keep going on preserving and keep a pulse on marine life and the health of all marine ecosystems. Thank you for taking the time for understanding the importance of the John H. Prescott Grant Program and how it’s used to keep marine mammal rescues going. You too can write to your representative and tell them that we can’t afford to cut the Prescott grant program because without it, marine mammal rescue organizations will have a difficult time funding rescue and conservation efforts just go to https://writerep.house.gov/writerep/welcome.shtml and start writing.